A crane or backhoe outfitted with a steel cable sling may be used to unload pipe unless the pipe has a special exterior coating that could be damaged by a steel cable sling. In such cases, a fabric sling should be used. 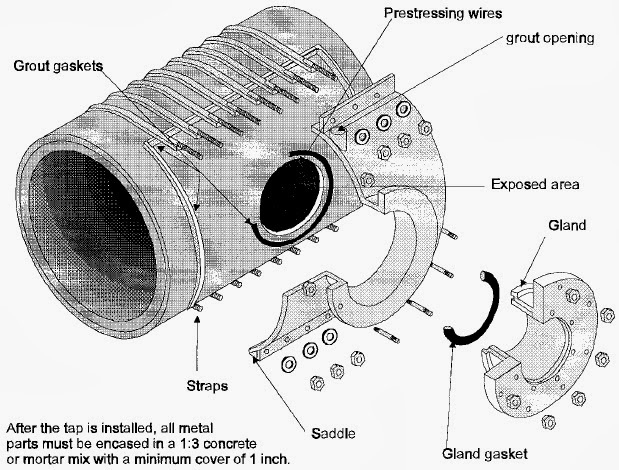 Multiple slings are often used in handling large pipe and fittings. Pipe can be stored directly on the ground in nonfreezing conditions. If freezing conditions are expected, the pipe should be set on wooden timbers off the ground to prevent the pipe from becoming frozen to the ground. Rubber gaskets should be stored in a cool place, out of the sun, away from fuel oil, gasoline, electric motors, and any other environment that can damage rubber. In most cases, the trench is excavated to be long enough for one section of pipe. The trench should be wide enough to allow installing personnel adequate room to work at the sides of the pipe. Pipe should not be laid directly on rocks or other unyielding foundation. Refer to the AWWA C304 standard for the bedding and backfill requirements for PCCP. Just prior to jointing, the steel joint rings should be carefully cleaned and the rubber gasket and contact surfaces of the joint rings lubricated. Only lubricant recommended by the pipe manufacturer should be used. Once the joint ends are properly prepared and the rubber gasket is in place on the spigot, the ends are aligned so the spigot will enter the bell squarely. Then the spigot is pushed home with a smooth, continuous motion. The position of the gasket is then checked in the manner recommended by the pipe manufacturer. A fabric band is secured around the exterior joint recess to receive the portland cement grout for corrosion protection. After the joint has been assembled and the exterior joint recess has been grouted, the pipe can be backfilled to grade. In general, the requirements for back filling rigid PCCP will not be as critical as for flexible types of pipe such as steel, plastic, and ductile iron. The backfill in contact with the pipe should not contain large rocks, clods, or excessive organic material. In most situations, a post-construction hydrostatic pressure test of the completed pipeline is required before final acceptance by the owner. For very long lines, it may be convenient to test shorter sections as they are completed rather than wait and test the entire project at one time. 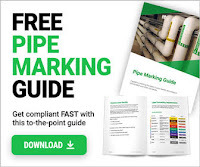 This test can verify the overall system integrity such as the restrained joints or thrust blocks and the watertightness of the connecting appurtenances such as valves, access manholes, and outlets. Occasionally, damage may occur in the field due to impacts from construction equipment or other objects. Minor damage can usually be repaired in the field by qualified personnel. Major damage may require shipment of the piece back to the manufacturing plant for repair or replacement. Before attempting any repairs in the field, the pipe manufacturer should be consulted for specific recommendations and assistance. During the design phase of some projects, areas of unstable soil conditions and crossings of small rivers, streams, or canals should be identified. In these cases, a pier support arrangement for the pipe may be needed. The pipe for this application must be designed and manufactured to span the supports and to resist the concentrated load applied to the pipe at the support. PCCP to be placed underwater such as for intakes, outfalls, or lake and river crossings may require special consideration for joining pipe underwater by divers. PCCP to be used for subaqueous lines may have modifications made to the joints to allow for joint engaging assemblies such as drawbolts, or special devices may be used which create a vacuum force to pull the joint home while the pipe’s weight is supported by a barge-mounted crane. In either case, it may be advantageous to use longer pipe lengths in order to minimize the number of underwater joint assemblies. The concrete and mortar linings and coatings specified in the AWWA C301 standard provide ample corrosion protection in most buried environments. There are, however, certain conditions where the ability of the concrete and mortar to provide a passivating environment around the embedded steel may need to be supplemented. Additional protective measures may be needed in these instances. Refer to the AWWA manual ‘‘M9—Concrete Pressure Pipe’’ for further information on the identification and evaluation of these conditions. The pipe manufacturer should also be consulted for specific recommendations and availability of supplemental protective measures. Outlets, tees, and wyes can be built into the pipe when their need is identified at the time the project is designed. When unforeseen circumstances occur that require outlets, connections, or branch lines on already installed pipe, tapping of PCCP can be done. Tapping PCCP for connecting outlets after a pipeline is installed is a common occurrence on most public works projects. Taps can easily be made on PCCP. In most cases, the tap can be done under pressure without interrupting service to customers. Tap diameters commonly range from NPS ³⁄₄ (DN 20) up to one size smaller than the pipe being tapped. For full size branch connections, a cut-in tee arrangement or a line stopping process may be feasible. The tapping saddle assembly used must be properly designed to work with PCCP. The strap-type saddle is normally used for tap diameters NPS ³⁄₄ (DN 20) to NPS 2 (DN 50). The flange-type saddle is used for tap diameters NPS 3 (DN 80) and larger. 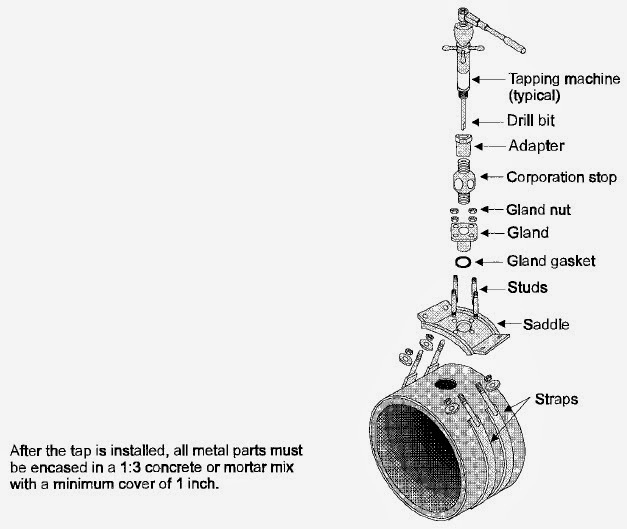 Consult the pipe manufacturer for additional information on tapping saddle assemblies and services provided.